Digital commerce websites have thousands and thousands of items available and high-quality navigation throughout the site, as well as advanced search options, are key to success. In the majority of industries, a well-setup navigation generates at least 60% of total revenue (Fashion e-retail), while searches account for more than 65% (Media e-retail). Private recommendations and comments in the product section can increase revenue by up to 10% as well. You can imagine that just a 10% increase in conversion rates related to search on-site performance will bring in millions of extra revenue. The major challenge is to show highly relevant content on eCommerce platforms that contain thousands and millions of items. Providing quality navigation lets customers limit the time and effort spent on looking for the product they want. If they can easily browse the items they are looking for, then the number of purchases on your site will increase dramatically. 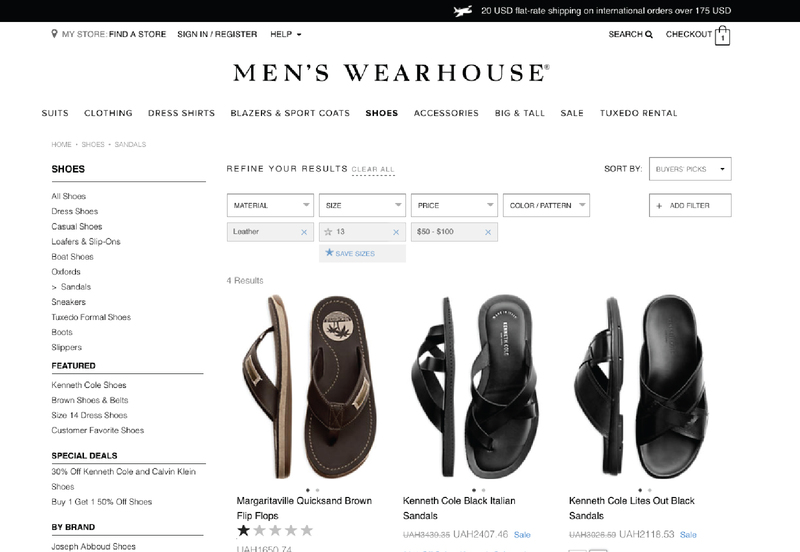 For this purpose, you can use Oracle Endeca, Solr or Elastic Search tools that have a level of flexibility desired by e-retailers to improve eCommerce site search. They employ the search based on user behavior, preferences, and other personalized data. In the era of eCommerce, accented search tools are more relevant due to the fact that you are required to know exactly what items your potential buyer wants! How does the search based on behavior patterns work? The vast majority of eCommerce websites provide visitors with the content prepared beforehand by marketers for a specific target audience. This is the classical way of doing things in e-retail. But do you really think that this entails a comprehensive understanding of any particular visitor? I am afraid it doesn’t. Your potential buyer can be looking for a variety of things, and your eCommerce platform should consider individual wishes and personal preferences. If you have a fashion site, it’s key to get to know trivial things like the apparel and shoe sizes of this person, as well as more essential things like age and gender. By creating a personal product search, you will get better sales. That simple! By taking into account all shareable data, customer’s profile, and user behavior, your business can apply predictive algorithms to offer top-notch individualized results. Website search in comparison to other metrics is usually neglected and passed over for future. But it’s vital to high-quality UX together with landing pages and email campaigns. It’s great when you can make a person visit your e-retail site, but to help them find what they need is equally important. It leads to more satisfying shopping experiences, as shoppers are very likely to come back and purchase more items, as the search for them was hassle-free. Don’t forget that you will also get more exposure as people tend to share their experience with others. But what about your eCommerce site? Business owners believe that for a small or medium sized merchant it’s virtually impossible to allocate necessary funds or people to have an intuitive search engine. But think again, as there are some easy detours to significantly boost your site search and engage your visitors. Having a basic site search seems like an obligatory thing to have on any eCommerce site, but amazingly, many small e-retailer don’t bother to include it on their front page. Some may have searched only on web or mobile, forgetting about a large portion of potential buyers. By excluding the search option website owners believe that they limit the expenditures, but they also lose their clients. In the fast-paced urbanized environment, people tend to have zero tolerance towards usability problems. 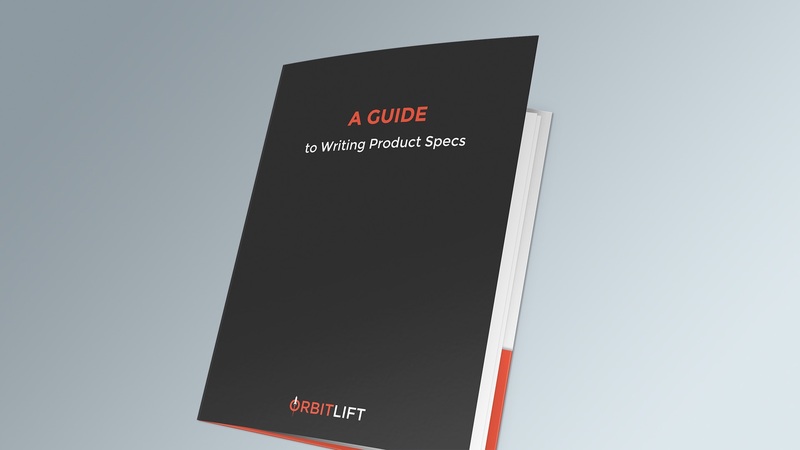 If they can’t search for the product they want on your site – you are destined for failure. That’s especially true on mobile devices. For the sake of your business – get a search option. Your small business may have zero to no budget for such things, so feel free to use Shopify themes that cost you nothing and come with a built-in search. Not having a site search is bad, but making people search for it may be even worse. Page design considerations seem to overtake the page, and the search field has only a tiny icon that is hard to notice. It leaves customers frustrated, and this is even worse than simply leaving the site. If your clients can find it, then there is no point in having it. Make it clearly visible and see your conversion rates rise. Time is money, and the faster your potential customer can find the item they want, the more likely they are to make a purchase. Google is the trend mover in this case. And if Google offers you any kind of search in the blink of an eye, then finding things clients want to purchase on your website shouldn’t take much longer. Making customers wait because of your aged system, old server, or programming glitches will result in a huge loss of customer base. Make search faster by opting in for a cloud-based search that does not require you to hold servers or special programming. This is especially great for small and medium-sized enterprises. eCommerce platforms like Shopify use a widespread network of servers on every continent. 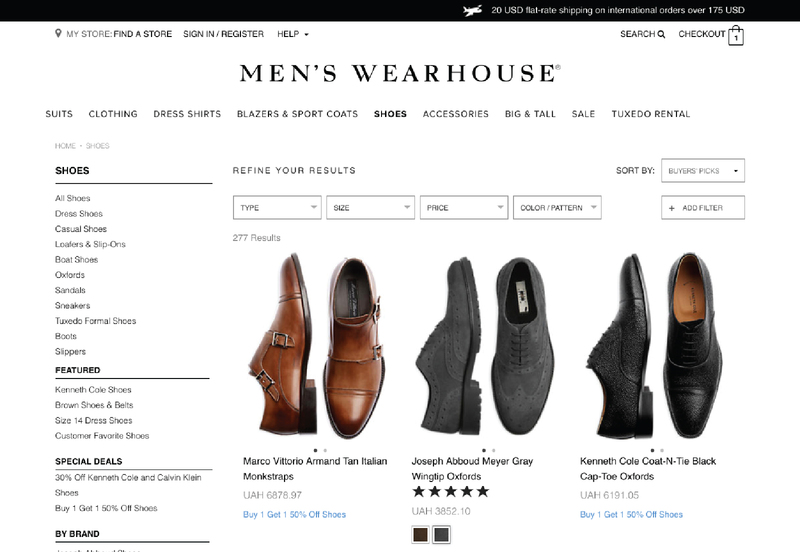 This lets their clients get your e-shop search done quickly. You may consider this option as well if you are looking at expanding your business in the nearest future. Setting up search is essential, but providing a relevant results page plays a key role in whether you get a sale or not. To have abundant checkout in the cart, you should optimize search a great deal. First of all, you should look at your target audience and the items they are likely to be looking for. For example, when potential buyers type in “blue” they should get a range of products with all shades of this color that can be easily customized according to shape, size, price, etc. Secondly, refining search according to items on sale and new arrivals is also beneficial. A few years ago there was no such thing until Google introduced it, and people got hooked on it, Indeed, why should you type in “red slim-fit jeans,” when you can simply write “red sl…” and the auto-completion will show you the exact phrase you want? Try typing anything in your eCommerce site search box, and if you have it right, you will immediately get a drop down box with several potential search queries. Customers don’t know it, but if it’s fast and accurate in predicting what they want, then there has been done a lot of work to analyze search history, emerging trends, and much more. In eCommerce, this issue is even more complex as you need to offer the best-fit products in the search box drop-down menu. Only then can a customer land on the page they want and click the “Add to Cart” button. This simplifies the purchasing funnel and lets impulsive buyers get what they want fast and without second thoughts. Such simplicity assures higher conversion rates and order completion. People tend to be very specific in what they want, and long search phrases can actually push the search engines to their limit. But using an engine that can handle it provides for better experiences and sales. 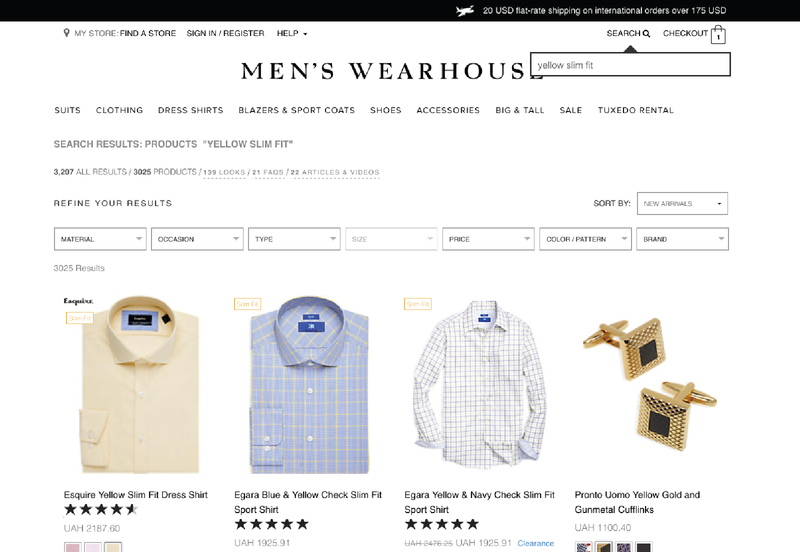 For example, let’s take a search query “male short sleeve green shirt size L.” With properly set up search this phrase will get you higher sales than just “male shirts.” Retail Integration Online states that e-retailers with a search engine that can process long requests have a mere 2% cart abandonment rate. Marketers are well aware how images and proper placement can increase interest and sales. But people rarely search for images and having a proper description coupled with high-quality images can prove very powerful. Proper wording and advanced search options can help your customers find what they want, and when they find it, they are more likely to buy a product when it has an appealing image. Before managing search options, it is wise to get to know clients’ preferences to offer high precision. Most search engines track the search items popularity. Google’s Keyword Tool, for example, lets you see the volume for any keywords for you to implement the best ones in your product descriptions. It’s quite simple, but many eCommerce sites don’t even bother to look at the list to get to know what buyers want. Having this kind of information lets you source for new products with vendors and improve search mechanisms to better suit your clients. Imagine that you are looking for the newly released book by Joanne Rowling, so go ahead and type in “Harry Potter” on Amazon. But you will get an Amazon online video! In reality, Amazon most probably is well aware of the new book and the large volume of searches for it, but it wants to promote its brand-new video streaming service as well. By considering popular demand in searches the company puts emphasis on its own retailing strategy. Having proper search engine for your e-retailer (your won servers or hosted) lets you add a lot of sophistication to the search process. Simple things like autocorrection of typos, ignoring out-of-stock products, or making your top products stand out in the list of suggestion are among most important things you can tweak to your benefit. Finally, to provide the best experiences to your clients shopping on your eCommerce site you need to take into account a multitude of factors, like purchasing behavior, popular items, correlation of pictures and descriptions and many other tiny but important for every individual issue. By ensuring that your shoppers find exactly what they want and making this process fast, you will create more and more successful buyer experiences and get a boost to your conversion rates. Leave behind generic word search that showcases only the most searched for products that may not be a good fit for this particular person, and move into the era of individualized experiences for shoppers.